A finished quilt and picture post. 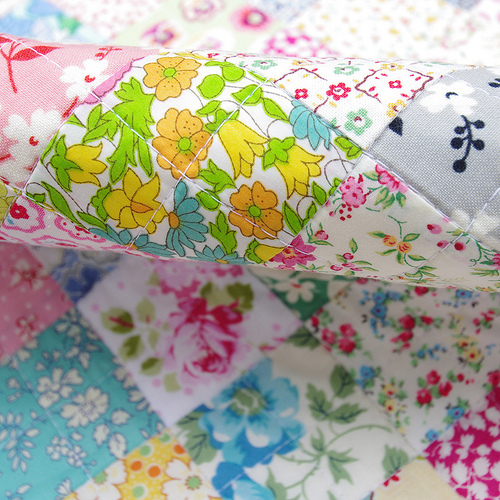 I love a quilt roll! This is the finished Scrappy Liberty Patchwork Quilt that I was working on last week and it is everything I imagined it to be. 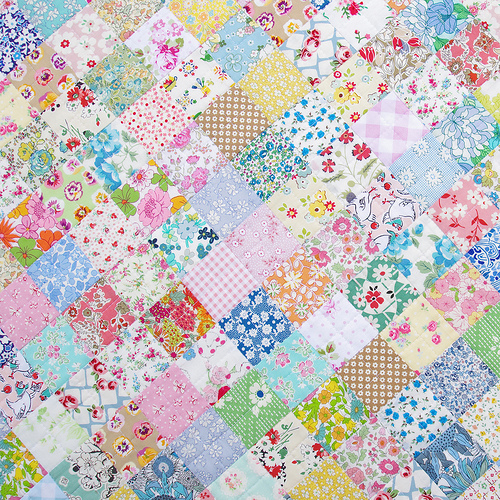 I really do love a simple patchwork quilt, and you can't go wrong with a mix of small scale floral prints together with Liberty Tana Lawn (although I am not sure that this small image of the whole quilt does the gorgeous fabric any justice). The patchwork squares each measure 2 inches x 2 inches (finished) and I estimate that I have used close to 80 different small scale floral fabrics, although not all are Liberty Tana Lawn (and several are reclaimed vintage floral prints). I have quilted the quilt with an all over 1 inch grid (intersecting horizontal and vertical lines) and as a result all seam lines have been ditch-stitched. The quilting lines running through the center of each square have been stitched with the assistance of a quilting guide - attached to the walking foot - in an effort to keep the lines nice and straight. For the back of the quilt I have used the last of my hoarded yardage of the Bouquet design from the Posy Collection by Aneela Hoey. Use it or lose it is my motto for 2014. And I have finished the quilt with a scrappy binding. 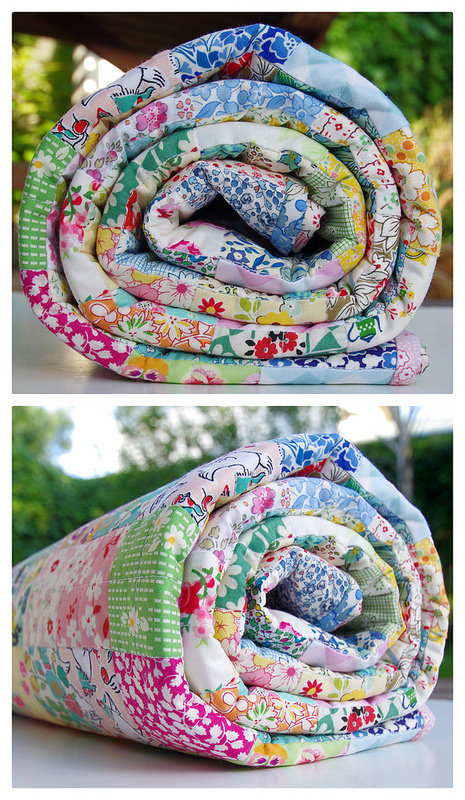 Scrappy quilt + scrappy binding = my patchwork heaven. 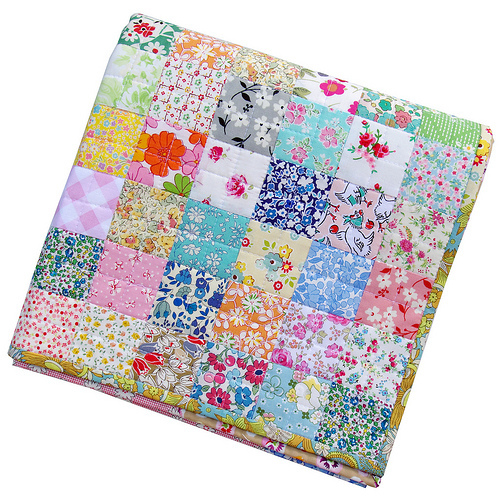 You will find the listing here: Scrappy Liberty Patchwork Quilt. Although I have 3 completed tops waiting to be basted I am inspired to start cutting squares from my vintage sheet stash. Glorious quilt. 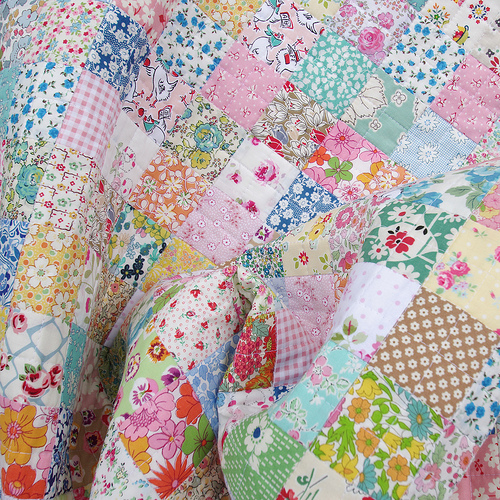 love your stunning quilt Rita! Photos are super too. What a beautiful quilt! Your eye for colours and prints is, as always, spot on. I love it, gorgious work! A quilt to dream under, and I applaud your 2014 motto. Not sure if I could live up to it! Absolutely adorable!!! Love the front, love the back, love it all. Just brilliant! Anything Liberty is wonderful but you have done it proud! I bet it is soft and cuddly too! Oooo, smiley! Gorgeous florals! The quilting looks wonderful, I'm wondering how you avoid puckering? Any tips would be appreciated! I think this could be may favourite of your quilts, Rita, but it would be hard to choose. Just beautiful fabric and perfect execution, of course. It's so pretty! One of these days can you share a little more info about the quilting guide you use? Maybe you already have. Rita this is so beautiful. This just is so feminine and romantic looking. It really appeals to my inner girly girl. Interesting that you mixed Liberty Tana Lawn with non-Liberty prints. I considered doing that with my recent Liberty finish but when it came right down to it, I considered that polluting, LOL! This turned out gorgeous. I LOVE it! 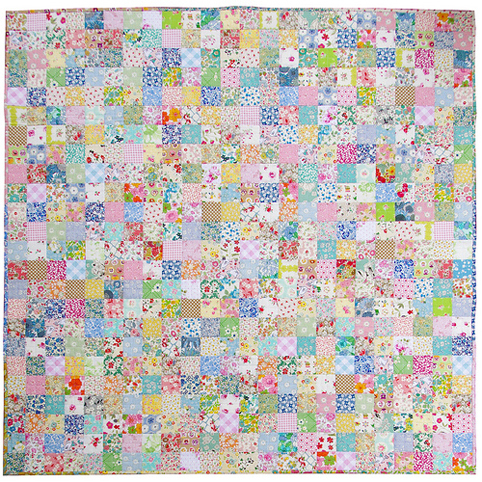 You're right, you can't go wrong with small square patchwork! It's beautiful!!!! Liberty loveliness! This is gorgeous. I would like to make a Liberty quilt someday, probably a scrap quilt. Of course the fabric is gorgeous but very pricey. 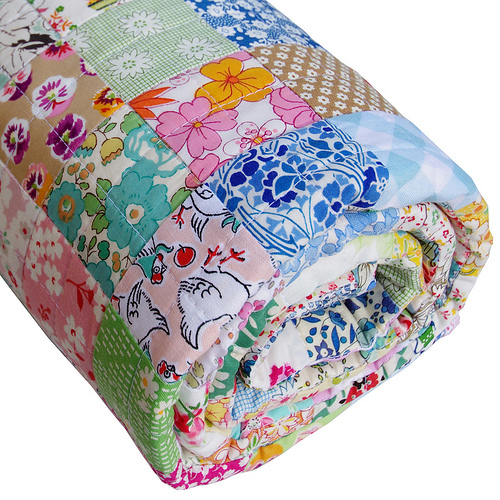 Do you have any tips on finding Liberty fabric "cheap"? It seems that even bags of Liberty scraps are not cheap. Gorgeous quilt, Rita! 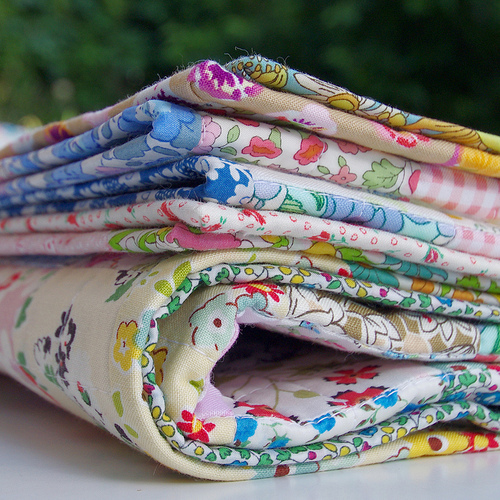 Love all the pretty fabrics--you have so many in there! Maybe I'll have to make 2014 my year to use it or lose it--does no good hoarding my favorites! Pretty quilt! and your photography is excellent! This is beautiful. I have just a few Liberty scraps and I haven't used them yet as the weight of the fabric seems so different from the rest of my stash. Perhaps one day I will have enough for a whole quilt. Yours is an inspiration! I so would have bought this and wouldn't have cared what it cost! Alas, it is already gone! It is just beautiful. I think I may have to adopt your motto for 2014, too!! Love your beautiful and charming quilt. I understand why you sell your quilts, to buy more fabric! I have a hard time letting go of mine but I think 2014 is going to be different. Thank you for your lovely inspirations Rita. I'm dizzy with admiration. Oh thank you for sharing your pictures!!! 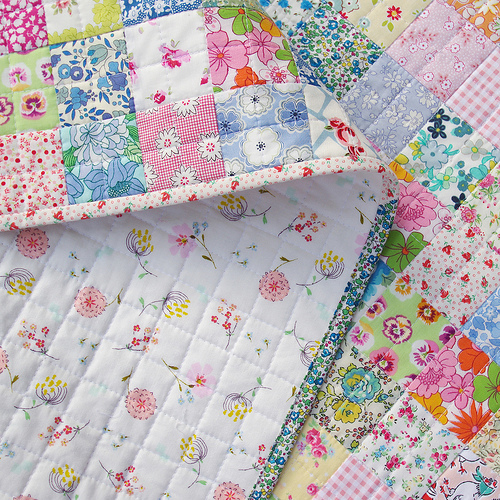 Scrap quilts are such a feast for the eyes. Such a feast of deliciousness. great pics. On to the next! Oh, how gorgeous! It's so scrapptastic! Very very pretty Rita! You always do such beautiful work! Rita, this quilt, as with all of your others, is GORGEOUS! Thank you for sharing it with us. lots and lots of 2" squares here, lovely quilt. Toady I am going to catch up on a new documentary that started yesterday on the Liberty shop in London, fell asleep so missed it last night! that quilt makes me happy all over!! just love it. i am all about the fabrics, not intricate piecing. love simple squares that showcase the colours and fabric. well done. love it.